Here's a new thread to lighten up the mood from all of those bodybuilding strains, our own pet discussions. 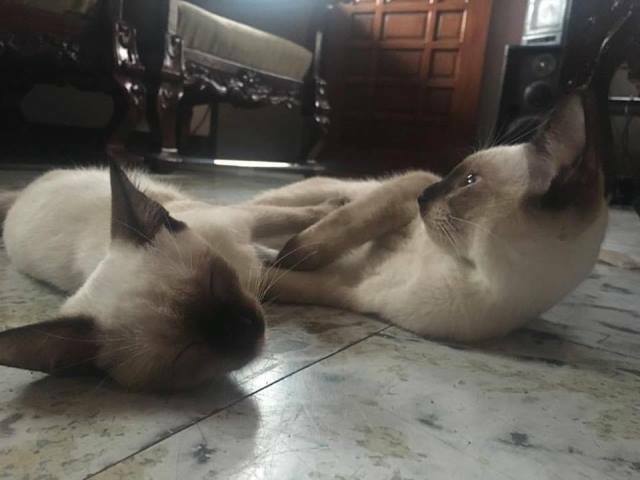 I own two Siamese Cats named Sheila and Sissy. When I'm stressed from work, I come home to these furry little tykes, both of them purring for some cat food and cuddles. They’ve been with me for years and the three of us are as tight as a drum. My wife loves them as well, which is why she plays with them in our yard most of the time. She doesn't have to carry them out, as we have installed a cat door, as while they’re definitely very adorable, they're still independent cats and the cat door would let them get out with no hassle (but still with supervision). How about yours? Feel free to share your pet stories with us.